A Wi-Fi–enabled DSLR or mirrorless camera, paired with a smartphone or tablet, offers several advantages, such as wireless transfer of images, the ability to review shots on a screen larger than the LCD on the camera body, remote shutter control, and other features. All of that requires good software, and too often the manufacturer’s efforts are basic or unreliable. Cascable 3 for iOS is the better alternative that adds features many of the camera companies don’t. It’s available for free with a limited but solid set of capabilities. An in-app purchase adds Cascable Pro features. One of the main reasons to use Cascable is to control the camera without being near it. Instead of setting a timer and dashing into a family photo, you can compose the shot on the iPhone using a live preview of what the camera is seeing (“Move left, Mom. A little more. Perfect.”) and trigger the shot when everyone is smiling. An Apple Watch app with a giant white button makes it less obtrusive that you’re remotely firing the trigger. Even better is the ability to adjust the image settings from the app itself. Tweak shutter speed, aperture, ISO, and exposure compensation using easy to use controls. Tap on the screen to set the camera’s focus point. 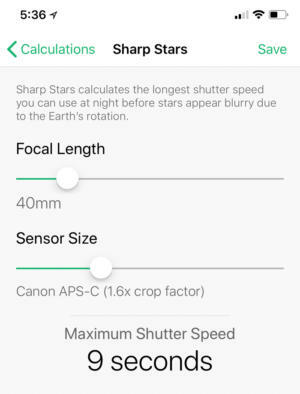 You can display a live histogram to help you avoid over- or under-exposing areas, and a focus peaking option highlights sharp areas in red to aid in getting your focus correct (especially helpful when shooting in the camera’s manual focus mode, although then you need to be near the camera to adjust the lens manually). Remotely control your DSLR or mirrorless camera using Cascable’s live preview and exposure controls. In general, these remote features worked great, but sometimes Cascable would get stuck on an exposure; even though I could manipulate the shutter speed, for instance, it made no change in the preview or in the captured shot. I had to disconnect from the camera, turn it off and back on, and make a new connection. This shot is stuck at being overexposed, even though I’ve adjusted the shutter speed to compensate. Some features are dependent upon the camera model. On my Fujifilm X-T1, Cascable doesn’t let me change the autofocus mode or drive mode (such as single or multiple-shot bursts). Some cameras will display a preview of a shot after you take it, but not mine. I have to exit the live view mode and browse the photos, allowing a few seconds to download the preview from the camera. Fujifilm cameras also limit Wi-Fi image transfer to JPEG files only, not raw files. For cameras that do, the Quick Proof feature presents an editing interface to adjust raw files, taking advantage of the native Display P3 color gamut of devices such as the iPhone X. Check the Cascable camera compatibility list for details. The Shutter Robot feature offers several options for remote shooting. It will work as a simple timer, of course, if you like jumping into frame; the advantage with Cascable is that you can set seconds or minutes as the delay, not just the typical 3 or 10 seconds. As an intervalometer, you can choose to snap images on a schedule, such as once every minute, with the option to stop after a fixed number of shots or a specified amount of time. Time lapses are easily configured using the Shutter Robot. A Bulb Timer keeps the shutter open for long periods. Exposure Bracketing sets the number of photos to take and the difference in exposure between them; for example, you could choose to capture 5 images at different exposure settings to get the brightest and darkest values for a scene, then combine them in software later to create an HDR (high dynamic range) composition. Calculate the best shutter speed to keep stars sharp during long exposures. Cascable can use the iPhone’s GPS capability to save a record of your location over time. That record can then be exported as a GPX format file, which, when imported into an application such as Lightroom Classic CC, assigns locations to photos based on their timestamps. A Calculations screen is purely informative, but helpful. 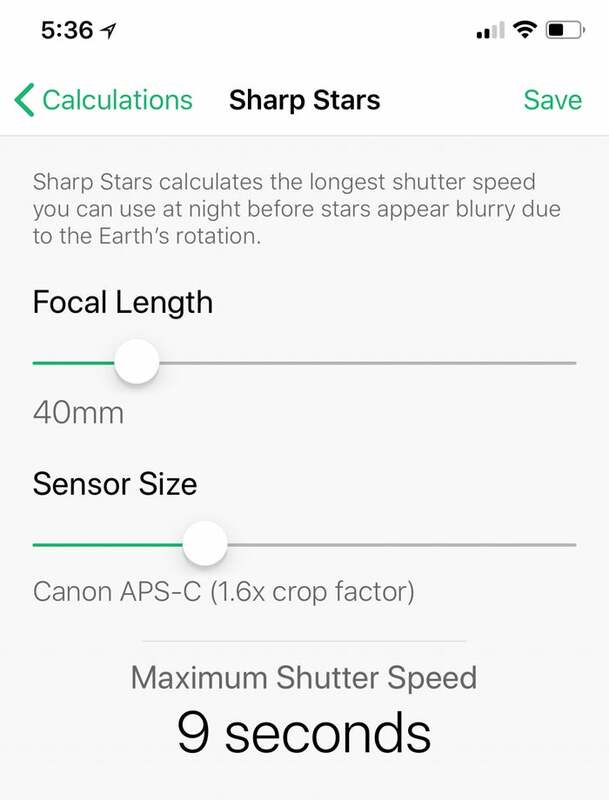 Enter a lens size and your camera’s crop sensor, and Cascable will tell you how long to keep your shutter open to capture starry skies without blurring them. Or, calculate shutter speed when using neutral density filters. Cascable incorporates the iOS Files infrastructure, which means other apps that use it, including the Files app, can open or copy images directly from Cascable’s app storage—no need to round-trip through the Camera Roll. On the iPad, images can be dragged and dropped between apps. Cascable on its own is free. Upgrading to Cascable Pro via in-app purchase unlocks the Raw support, automatic location tagging in the background, the GPX file export, the Shutter Robot features (beyond the basic timer), instant previews, and a Night mode that gives the app a dark interface. Pay for a one-time purchase of $30. Use the Pro features as a free trial for three days, then pay $3 per month, billed monthly (or $36 per year). Use the pro features free for one week, and then pay $2.00 per month, billed quarterly (or $24 per year). These plans seem to target everyone: people who want to pay once and not worry about it; people who want to use the app for a short amount of time, or have the flexibility to cancel during any month; or people who don’t mind an ongoing quarterly payment. Too often, the Wi-Fi feature built into some cameras goes ignored because the manufacturer’s software is limited or half-baked. Cascable takes full advantage of the ability to control and communicate with the cameras from an iPhone or iPad.